clay and limestone: Willowleaf aster, a must for your garden! Willowleaf aster, a must for your garden! While you're perusing the garden catalogs for beauties to add to your garden please look for Symphyotrichum praealtum. Just look at the color and bloom the morning after out temperatures dipped into the teens (Fahrenheit). A plant like this needs to be in your garden! 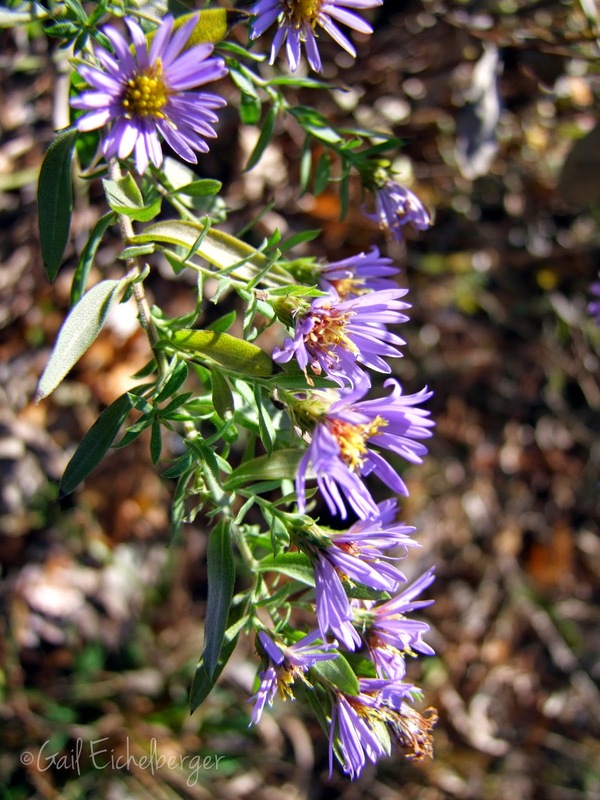 "Symphyotrichum praealtum is a tall grass prairie native that is harder to find than a tall grass prairie in Tennessee. It's listed as an endangered and threatened species in several states, including Tennessee, and in several Canadian provinces. (Go here to read about rescue efforts in Canada.) " Luckily for me, blogging friend, Sweetbay, generously shared several starts of 'Miss Bessie' a few years back. They bloomed that first fall and every November since then. It's ironic and wonderful that an endangered Middle Tennessee wildflower found its way home from NC. The resident pollinators send their thanks and love to you SB." I've written about 'Miss Bessie' before...Sweetbay refers to Willowleaf aster as 'Miss Bessie' and I do, too. 'Miss Bessie' has been the star of several Wildflower Wednesday post and she's a member of the Clay and Limestone rough and tumble wildflower club. 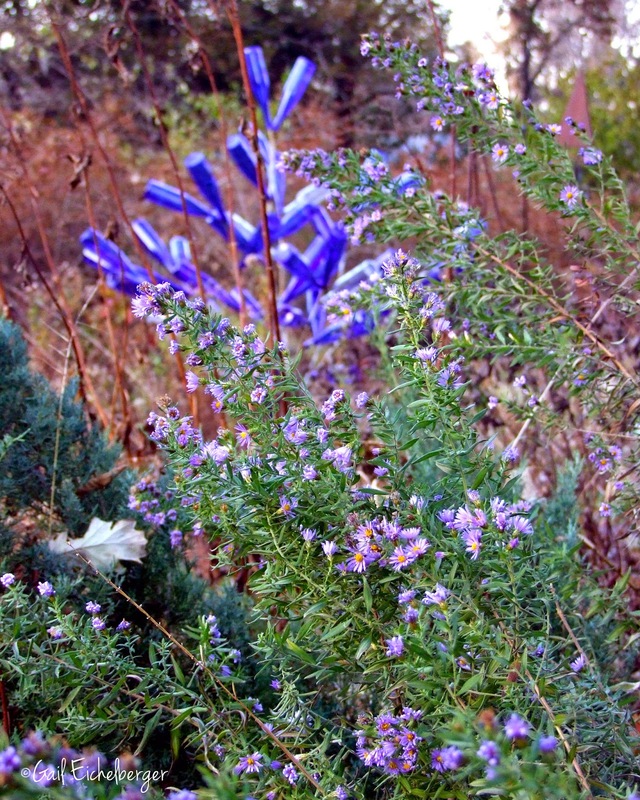 Most of the rough and tumbles are late summer/early fall bloomers, but, Willowleaf aster shines in my November garden! You know how much I love all the rough and tumble wildflowers, they're simple flowers that bloom their hearts out and require no special care, well, that's exactly how I would describe Willowleaf aster. She's an ex-aster, expect her to travel, but, you can easily transplant any seedlings to other parts of your garden. She stands straight and tall until the top heavy blooms lean toward the sun. The flower heads sway in the slightest breeze and only patience and hundreds of shots yields a good photo of nectaring pollinators. Knowing that this extremely important late fall pollinator food source could survive several 17F nights makes me jump for joy. Native in green~Not sure why South Carolina is not on the list! I recommend we all plant more of this native beauty! As you can see, it's native in eastern North America...except South Carolina! Sources suggest that it's a go to food source for migrating Monarch Butterflies. If you garden along the monarch trail Willowleaf aster might be a perfect addition to your garden. (Prairie Moon Nursery has seeds). So, my dear readers, please join me in planting more native ex-asters! I know your pollinators will appreciate the marvelous and floriferous 'Miss Bessie' and you'll love having blooms in late fall. PS It goes without saying, but you know me, I have to say it. If you want pollinators to visit your garden, you must, never, ever, ever, ever use pesticides. I'm not kidding...NEVER! A wonderful ex-aster indeed and you are lucky to have such a great friend to share hers with you! I love adding as many asters as i can for fall. I just sowed a bunch of aster seed last month in hopes of adding more to the meadow area. I will have to keep my eyes open for this one! I admired 'Miss Bessie' on Sweetbay's site earlier. I'm equally envious of yours. Too bad its range doesn't include Southern California. Summery looking blooms even in the depths of winter, fabulous! Sounds like an excellent choice. I will be on the look out for it. Re the map reference, how curious that it is not endemic to only South Carolina! Is it because of a difference in soil, I wonder? I would like this plant coming up around and in bare shrubs for support, I think. I love providing late food sources for pollinators. I've long admired 'Miss Bessie' on Sweetbay's blog, but I didn't know she grew in your garden, too, Gail. The ability to survive such cold temps and a food source for Monarchs is enough to convince me to add her to my plant wish list! What a great plant to extend the growing season, too! Still blooming in December - wow! Glad to see some endangered plants are being revived in their native region. It is sad how many plants we lose. The pollinators do love this plant! I think it's a must, especially in a Southeastern garden, because not very much is blooming at that time of year and the pollinators are still active and need food. In November the chief sources of food here are Miss Bessie and groundsel trees. Plus, the flowers are purple and both the plant and the flowers are tough as nails. I am so glad Niche Gardens offers her for sale.